'Helmet, Cork, Aviation'. Stores ref. 22c/13. Size 63/4. Issued to aircrews based East of Malta. First issued in the 1920s and remaining in service until superseded by the cotton drill D-type flying helmet in 1941. 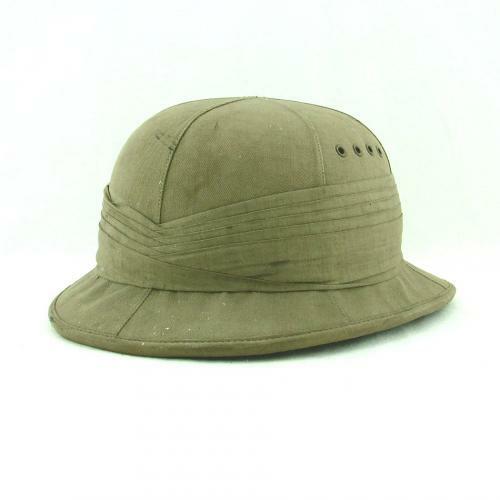 Manufactured from lightweight cork in the form of a pith helmet covered in light khaki coloured cotton drill. These are fitted with earflaps in the same material, backed with chamois leather to which a chinstrap with pronged buckle closure is attached. The earflaps complete with pockets to take Gosport fittings or receivers. Also has a concealed goggle strap at the rear, attached to the inner leather band. The overall shape of the helmet is pretty good but if you feel around the brim there is evidently some damage to the rear section. This does not detract from the appearance. The earflaps and chinstrap are absent but their removal has been well executed leaving no signs they were ever in place. The outer fabric is a bit grubby but undamaged. Some wear and soiling to the lining. Air Ministry King's crown stamp, size details and 193? date mark in the crown. Named to 'J Gunn'. This rare helmet has evidently seen considerable use but remains in sound condition and is an excellent display piece. Would be twice the price in complete condition. Stock code H21551.